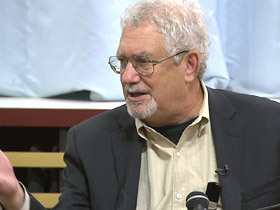 LEWIS RICHMOND (Buddhist teacher and author, Aging as a Spiritual Practice): Buddhist wisdom begins with a very simple principle — everything changes. The things that we love and cherish will change, will get old, including us, and pass away. A big challenge for us is to see aging as it really is. Not as we imagine it, not as the society or advertisements say it is, not as our friends say it is, but what is it really for us? (to audience): This book is a user’s guide to aging well. 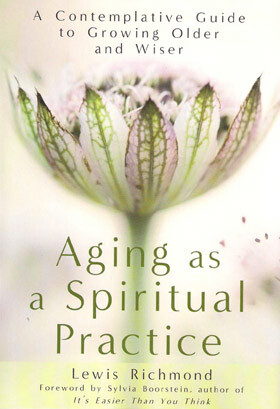 It is about aging from a spiritual perspective. All of Buddhist spiritual practice is a kind of great re-framing. Seeing all of human life differently, much more positively, and deeply. So Buddhist mindfulness practices, as it relates to aging, is really...pay attention, pay close attention, to what’s really going on in your body, in your emotions, in your fears. (to audience): It’s about the courage to just be there, you know, to be there in whatever your life is bringing you. Illness does come more as we get older. We also worry about money and is there going to be someone there to take care of us when we need it? Lots of worries and I’m very candid that, yes, this is the way it is. I’m not pretending to erase all of that with some magic potion. What I’m offering is something different, is find a different approach, a different way of seeing it, a different level of meaning, a different context that’s bigger than just those things. (to audience): This is a gratitude practice. I want you to close your eyes. When you hear the words, ‘thank you,’ I want you to notice the first thing that comes to mind. One woman said, “I never knew that I was thankful for my eyes, my eyes, that I could see,” and she started to cry. (to audience): As we age, may we be filled with loving kindness. As we age, each of us, may we be free from suffering, to the extent possible. And, as we age, may we be happy and at peace. I had a Buddhist teacher who once said, “Every breath, new chances.” This is a great teaching for older people, because part of aging is “there are no more new chances for me, I’m stuck with what I’ve got.” Well, that’s not really true. Every breath, every day, every morning, every person you meet, is a kind of new chance. Every religion has its form of contemplative practice. Though Buddhism has many meditation practices, it is first and foremost an ethical teaching and a way of life. I have heard anecdotally that Thich Nhat Hanh, the Vietnamese Zen teacher, was once asked to summarize all of Buddhist teaching in one word. He said “Ahimsa,” which means “non-harm” or “nonviolence.” This is the first ethical precept of Buddhism. The term is thousands of years old and goes back at least to the Vedic Hinduism of ancient India. Mohandas Gandhi made ahimsa the centerpiece of his doctrine of nonviolence. This is the Golden Rule spoken as a Buddhist. To practice ahimsa is to follow Buddhist values, whether you call yourself a Buddhist or not. Meditation grows out of the ahimsa spirit and is a central expression of it. The application of Buddhist meditation to aging is another application of the ahimsa spirit. Our increasingly fragile and infirm bodies and minds are sacred, and worthy of the greatest kindness and care. To respect our aging at every stage is the greatest kindness we can offer to ourselves and those we love.